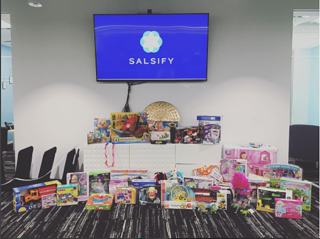 Last week at Salsify we hosted our annual Toys for Tots drive. Much of what we do every day at Salsify is focused on our customers. So even when it comes to holiday shopping, we found ourselves thinking about the wide range of brands we work with. In that spirit, each of us selected one of our customers and donated a toy inspired by that company. In some cases, it was a matter of buying directly from Marbles: The Brain Store or getting our favorite item from toy brands Alex Brands and Manhattan Toy Company. In other cases we had to get more creative, like buying toy dinosaurs (a dream pet in honor of Mars pet food brand IAMs), a junior circuit board set (for budding inventors in honor of consumer electronics maker Kanto Living) and a pirate ship play set (in honor of Chips Ahoy! maker Mondelez). Thank you to all of our customers for inspiring us to support hours of learning and play in 2017! All of our donations went to the Massachusetts Department of Children and Families and will be given to kids living in our neighborhood: Boston.